Princess Orihime weaved night and day, so much so that her father, the emperor of the galaxy, arranged for his workaholic daughter to meet Hikoboshi, a handsome cowherd. It was love at first sight, and the couple married immediately. Busy being a devoted wife, Princess Orihime soon neglected her weaving. This angered her father; first she was weaving too much, then she wasn’t weaving enough. So, the emperor separated the young lovers, sending Hikoboshi to the other side of the Amanogawa, or the Milky Way. Beside herself with loneliness, Princess Orihime cried and cried. Her tears began the rainy season. Her father couldn’t stand to see his daughter in this state, so he allowed her to visit her beloved one day a year, on the seventh day of the seventh month. This story, which originated from Chinese folklore, is the basis of Tanabata (literally “night of the seventh”), or the Star Festival. 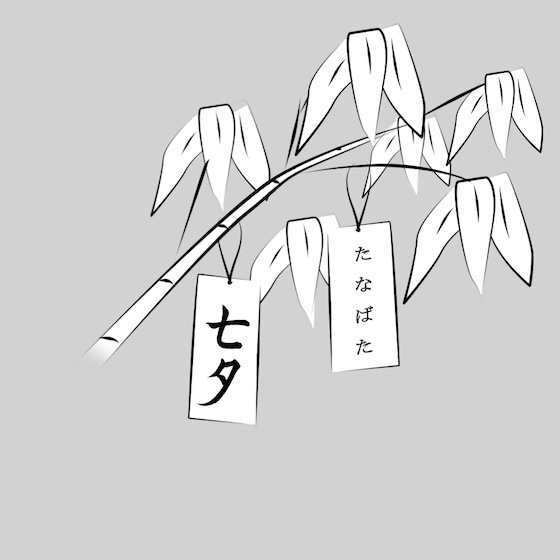 To honor Orihime and Hikoboshi, the Japanese write their wishes on thin strips of paper called tanzaku and hang them from bamboo branches. They await July 7 so that their dreams will come true. Here are a few establishments in New York City that are observing Tanabata. Robataya New York presents a special summer menu and sake offerings from today until Sunday, July 10. Located at 231 E. 9th Street (between 2nd and 3rd Avenues). Sakagura celebrates Tanabata with a Seven Sake Carafe Fair tonight. Located at 211 E. 43rd Street (between 2nd and 3rd Avenues). Japan Society offers storytelling and tanzaku making with children on Sunday, July 10 at 2:00 p.m. Tickets are $12/$5 Japan Society members (children 2 and under are free). Purchase tickets online or call the Japan Society Box Office at 212.715.1258. Located at 333 E. 47th Street (between 1st and 2nd Avenues). What are your wishes this Tanabata? Hope they come true!